Bridport Aikido Club would like to invite you to the Bridport Summer School 2005 held by our principal Sensei Kolesnikov (6th Dan). The Summer School will take place from Saturday 30th July until Friday 5th August. We hope that many members from the different clubs around Britain, and even the Ukraine, will come to help make this a great course. Everyone is welcome, whether they are an Aikido practitioner or not. The teachers of each club will be given an information pack including accommodation details, maps, popular sights and things to do. Exact dates of any tourist events in the area will not be confirmed until April-time when the local tourist board publishes them. If you would like information sooner than this then please check out www.westdorset.com on the Internet. If you are interested in attending the summer school then please give Andrew or Jake your name, club and contact details (see below). We also require a £10 deposit ASAP. The training will take place in the sports hall of a local school on a large matted area. It is within 20 minutes walking distance from the centre of Bridport but there is plenty of parking available if you want to drive. It also has full changing, showering and toilet facilities. The first training session will be on Sunday morning, and the last training day will be Friday August 5th. There will be 18 hours of general practice, and an extra 4 hours of high grades practice, over the course of the week. The training is for adults only. There will also be three additional 1 hour children’s lessons, on Monday 4-5pm, Thursday 6-7pm & Friday (in with the adults) 3-4pm. The training fees will be £64 for the general practice only, and £84 for both general and high-grade. This includes rental of the dojo for the week. Salsa? (at club or in manor) Salsa? Training will take place at the Sir John Colfox School on the outskirts of Bridport. Please see the map below for directions. The school has shower and changing facilities, and there are plenty of parking spaces available. From the centre of Bridport, head east along East Street and continue until you get to a roundabout (Texaco). Take the first exit (North), and continue straight along this road for just over a mile until you get to a sign for a roundabout. Turn left immediately before the sign into Colfox school. If you reach the roundabout then you have gone too far! Turn around and take the first right into the school. At Colfox school , carry straight on through until you reach the car park. The dojo is the large sports hall on the right hand side of the school. Go in through the glass doors and turn right to get to the changing rooms. If you are booked into the Old Rectory then it is available from 4pm Friday 29th July until 10am Friday 5th August. Please note that you will need to be packed and out of the Old Rectory by the first training session on Friday! We would recommend that you change and shower at the dojo since the Old Rectory is at maximum capacity. From the centre of Bridport head west along West Street, and carry on straight over two mini-roundabouts. Keep going along this road and you will soon get to a 40 mile per hour limit. Not far past this take a right turn (signposted Symondsbury) just before a white house on your right hand side. Go straight down this road until you reach a T-junction. 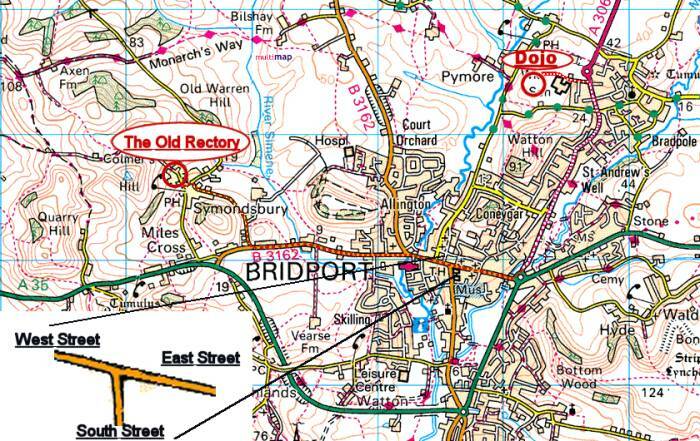 Turn left, and you will see the entrance to the Old Rectory directly in front of you, about 100 yards away. As well as the Old Rectory, Bridport has quite a number of hotels, inns, guesthouses, campsites, B&Bs, and self-catering cottages. See the information pack and the Internet for details. It is surrounded by beautiful, peaceful countryside, with many hills and walks. (Nearly always) great summer weather. Wednesday and Saturday Street Markets. A nearby sandy beach and cliffs. West Bay with loads of seaside attractions. A strong arts influence, with an arts centre. A fully equiped, modern Sports Centre with Swimming Pool. Café’s, Restaurants, loads of Pubs and a Night Club. Real ales and red cider. Dorchester, Yeovil, Weymouth, and Exeter are close by for cinemas and shopping. Near the White Horse and the Cerne Abbas Giant. (Second) Home of PJ Harvey, Martine Cloones, and Hugh Fearnley-Whittingstall.